If you are in Tempa, AZ, then stop being held hostage by your dealer or personal mechanic. Let Tempe Mobile Auto Repair set you free. Call and give us a try to help you to get back your vehicle on the road. ​Tempe Mobile Auto Repair is an automobile specialist that brings you the convenience of getting your automobile fixed without having to use your personal time. We do this by bringing the repair shop to you. You can now get your vehicle fixed while you work, while you cook dinner, watch television, check your emails, or whatever it is you need to do. No longer will you waste your days off waiting to get your automobile fixed. Tempe Mobile Auto Repair is the solution. 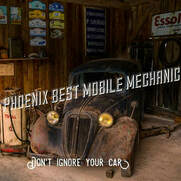 Call us right now at Tempe Mobile Mechanic : 602-975-4967 Mobile Mechanic Tempe, AZ.